Are North America’s wild horses native? Should the wild horses that roam North America be considered native wildlife? They may have been “introduced” by man, but scientific evidence suggests that they are genetically the same as the horses that became extinct on the continent between 11,000 and 13,000 years. In fact, the genus Equus could have been wiped out entirely had it not crossed the Bering Stait land bridge into Eurasia. Jay F. Kirkpatrick, Ph.D. and Patricia M. Fazio, Ph.D.* look at the evidence. Are wild horses truly “wild,” as an indigenous species in North America, or are they “feral” weeds – barnyard escapees, far removed genetically from their prehistoric ancestors? The question at hand is, therefore, whether or not modern horses, Equus caballus, should be considered native wildlife. Had it not been for previous westward migration, over the land bridge, into northwestern Russia (Siberia) and Asia, the horse would have faced complete extinction. However, Equus survived and spread to all continents of the globe, except Australia and Antarctica. Critics of the idea that the North American wild horse is a native animal, using only paleontological data, assert that the species, E. caballus (or the caballoid horse), which was introduced in 1519, was a different species from that which disappeared 13,000 to 11,000 years before. Herein lies the crux of the debate. According to the work of Uppsala University researcher Ann Forsten, of the Department of Evolutionary Biology, the date of origin, based on mutation rates for mitochondrial-DNA, for E. caballus, is set at about 1.7 million years ago in North America. Now the debate becomes one of whether the older paleontological fossil data or the modern molecular biology data more accurately provide a picture of horse evolution. The older taxonomic methodologies looked at physical form for classifying animals and plants, relying on visual observations of physical characteristics. While earlier taxonomists tried to deal with the subjectivity of choosing characters they felt would adequately describe, and thus group, genera and species, these observations were lacking in precision. 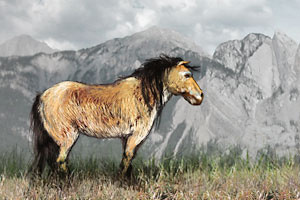 Finally, the work of Hofreiter et al,5; examining the genetics of the so-called E. lambei from the permafrost of Alaska, found that the variation was within that of modern horses, which translates into E. lambei actually being E. caballus, genetically. The molecular biology evidence is incontrovertible and indisputable. The issue of feralization and the use of the word “feral” is a human construct that has little biological meaning except in transitory behavior, usually forced on the animal in some manner. Consider this parallel. E. Przewalski (Mongolian wild horse) disappeared from Mongolia a hundred years ago. It has survived since then in zoos. That is not domestication in the classic sense, but it is captivity, with keepers providing food and veterinarians providing health care. Then they were released a few years back and now repopulate their native range in Mongolia. Are they a reintroduced native species or not? And what is the difference between them and E. caballus in North America, except for the time frame and degree of captivity? The non-native, feral, and exotic designations given by agencies are not merely reflections of their failure to understand modern science, but also a reflection of their desire to preserve old ways of thinking to keep alive the conflict between a species (wild horses) with no economic value anymore (by law) and the economic value of commercial livestock. Native status for wild horses would place these animals, under law, within a new category for management considerations. As a form of wildlife, embedded with wildness, ancient behavioral patterns, and the morphology and biology of a sensitive prey species, they may finally be released from the “livestock-gone-loose” appellation. 1 “Horse Evolution” by Kathleen Hunt; Bruce J. MacFadden, Fossil Horses: Systematics, Paleobiology, and Evolution of the Family Equidae (New York: Cambridge University Press, 1992), p. 2052 Patricia Mabee Fazio, “The Fight to Save a Memory: Creation of the Pryor Mountain Wild Horse Range (1968) and Evolving Federal Wild Horse Protection through 1971,” doctoral dissertation, Texas A&M University, College Station, 1995, p. 21. 3 Ann Forsten, 1992. Mitochondrial-DNA timetable and the evolution of Equus: Comparison of molecular and paleontological evidence. Ann. Zool. Fennici 28: 301-309. 4 Carles Vila, Jennifer A. Leonard, Anders Gotherstrom, Stefan Marklund, Kaj Sandberg, Kerstin Liden, Robert K. Wayne, Hans Ellegren. 2001. Widespread origins of domestic horse lineages. Science 291: 474-477. 5 Hofreiter, M., D. Serre, H.N. Poinar, M. Kuch, S. Päbo, S., 2001. Ancient DNA. Nature 2: 353-359. * Jay F. Kirkpatrick, Director, The Science and Conservation Center, Billings, Montana, holds a Ph.D. in reproductive physiology from the College of Veterinary Medicine at Cornell University. Patricia M. Fazio is a freelance environmental writer and editor, and holds a B.S. in animal husbandry/biology from Cornell University, an M.S. in environmental history from the University of Wyoming, and a Ph.D. in environmental history from Texas A&M University, College Station. This document is the intellectual property of Drs. Jay F. Kirkpatrick and Patricia M. Fazio. As such, altering of content in any manner is strictly prohibited. However, this statement may be copied and distributed freely in hardcopy, electronic, or Website form. Please include footnotes. Article first published on Horsetalk.co.nz in September, 2006. Yes, That makes sense, unlike other negative reports! I have shared this out. The debate is over in my mind and has been for a long time. I have also read old journals of eye witness accounts of explorers coming upon unexpected herds of horses and stories of trading llong before the Conquistadors, but just the science of the DNA similarity is unrefutably the ONLY evidence that cannot be washed out the derogatory cowspeak of the livestock industry. I can hear that long drawn out stubborn bawl of the livestockers. History is our friend in this battle. I only hope the destruction of the wildlife will not have been accomplished before the tides turn. Go ahead a believe, it is only a fantasy. The modern horse, which is the product of 9000 years of genetic engineering by humans, did not evolve with north American ecosystems; 300-500 years is not time enough for anything to evolve. The preponerance of evidence counters the claims made in this piece of fiction. Maybe people who spend their entire time in a lab should go out in the field and look at the destruction horses cause, then decide if they “evolved” with the ecosystem? Native species are being lost to horses, thanks. And how many native species are lost to cattle? Pray tell. Cattle must outnumber horses on the range, being that they have economic value, and horses don’t. The horses are as American as the land itself, and we should have a place for them. Over bred TB’s don’t belong on the range, but certainly, any descendants of the conquistadors’ escapees could qualify for exemption from the brutality of the round ups. Think on that CB, soften up a little too, don’t be afraid to see the beauty. No one argues that the horse lineage began in N. America 300-500 years ago; instead, this was when they were reintroduced back into their original habitat. Selective breeding, of course, has been going on for several centuries but not nearly enough to wipe out the genetic evidence that these animals evolved in N. America in the late Pliocene and began moving west (and back east) during the 11 or so glaciations of the Pleistocene that allowed the Asian-American Land Bridge to episodically appear. Their 10,000-11,000 thousand year hiatus from N. America is hardly a blip on the geological time-clock. Incidentally, horse manure is great for our western grasses. Given enough room, horses can actually enhance the grasses that our dear cattle so enjoy. Nope! Wrong again. cattle destroy the Range, and you know this, in fact. When its damp, Cattle pull the range grass out by the roots with their prehensile tongues, while Wild horses clip the grass as a lawn mower does. Allowed to Migrate without fences in their way, Horses will leave an area they have grazed and return later when it is regrown. Wild horses have a unique gastric system which “reseeds” the Range and Wild lands. After denuding the range, Cattle open it to intrusive highly flammable grasses called “Cheat Grass” Cattle unfortunately don’t eat it, but Wild Horses do. When you’all removed Wild Horses, you left the West open to the fires raging now- not only due to hot winds and drought. Many Native Communities believe the Wild Horse was always here, not only reintroduced by Spain. The Wild Horse is indigenous Wild life. Ranchers on Public lands where many Wild Horses have roamed, provide only 3% of American Beef, while the rest is shipped overseas. Yet we the taxpayer, subsidize them. They want ALL of the Public Land which belongs to ALL of us, including Wild Horses. One reason why the BLM, Intrusive Industries, Corporate and “Welfare” Ranchers want Wild Horses removed right away, is so they can move their cattle and Fracking and other Industries onto land that hasn’T been destroyed yet and take over water holes used by Wild Horses and other wildlife. They would certainly like to do this quickly, before the Public wakes up, realizes there IS no overpopulation of wild horses at this time, they are merely in the way, and that cattle and other Industries have been lying to them for years. Susan Lefingwell – WELL DONE. Did you know that Sonny Perdue and Ryan Zinke took off to China late spring/early summer I think – to sell American beef to China, when our own beef prices make it nearly unaffordable? So if “they” (the Feds and these two jerks) decimate or extinct our precious wild horses and burros, who were protected by Congressional Act in 1971, there will be more room for cattle destined for Asia. Another little point – I have lived in this area for nearly 30 years. I can find fossil horse bones and teeth from the Peace River down in south Florida, to the springs and creeks and the Chipola River in my area. You are right that both horses and burros go easy on the land. I got my first desert-born burro when she was four and she started my lifelong love affair with them as companions, babysitters, guardians of the home and stock. They dig waterholes; both reseed the native plants and prevent range and forest fires. Thank you. It’s all lies. And our Congress are having incestual relationships with welfare ranchers, Oil, Mining, Minerals. wow. boy is that limited thinking. No, the native species are being lost to overgrazing by cattle and sheep, and man’s unthinking desttruction of our environment through unchecked logging, mining, damming up water sources, encroaching on wildlife by over building houses…basically, unchecked “progress” that does not take into accout the needs of wildlife. If you were to do more research on what horses eat vs. cattle and other ungulates, you might change your mind. You are wrong, CB, evolution can be and is rapid as well. In fact, evolution can occur in just mere decades, not just centuries or millennia. For example, watch Trey the Explainer’s video on the topic of rapid evolution. Please, don’t buy into the lies propagated by greedy ranchers, large companies, and corrupt government officials. Trust in the scientific evidence, and not biased lies. There is little question now that the debate over whether our wild horses are native or not has now been ended as a scientific issue. That leaves next the claim by corporate profiteers that wild horses – or any species- for that matter- is without economic value compared to livestock and without inherent value because it isn’t to be weighed in the butcher’s scales before assessing its value. Wild horses do have economic value to states who advertise them in their tourist brochures- and yet then betray them to those now rounding them up in Wyoming and Nevada to lead lives as zoo animals at best, slaughter at worst. More importantly, wild horses have inherent value to themselves, just as human beings do, because of their desire for life, liberty and the pursuit of happiness. They have value to Americans because they are a symbol of Nature and freedom independent from human corporate control. And this is the real reason corporations intent on destroying Nature want them to vanish from the American West. They don’t like Americans to be reminded that our original loyalty is to the natural world, not the artificial and contrived world of Profit. NATIVE or not we humans are not native unless you are talking about us Native Americans i could say more but don’t want to open a can of worms!!!!! horses were brought here for a reason work, play, etc not to eat or destroy for the purpose of cattle grazing. Sylvia, that is stupid. Like your saying native americans are not the same humans as others, do we not share the same DNA? But if you want to get really technical. Native Americans are not native either. They come from Asia, where they are not native either. Humans are natives of Africa. You do realize if they are considered native by the government overpopulation will be dealt with by a hunting season like native deer turkeys elk etc. We don’t hunt our Native species eagles do we? ! Horses are Native species and evolved on North America. Horses heal the grasslands. Clearly, it did not. It habitat changed and it went extant(I believe that is the right word). If it had evolved with its habitat it wouldn’t have died out. They are feral and no amount of fluffery will change that. They were possibly wiped out by early humans who came into the Americas around that same time. Exactly, and though some may think Native Americans are more in tune with the nature than colonizers, in fact they eradicated most big mammals, just like other humans did around the globe. the thought here is not that they could not evolve with their habitat, but that they may have been hunted to extinction from North America. However, there is a tribe of Canadian Indians who have what they claim are the original horses of the Americas, which were said to be witnessed by early explorers before the conquistadors arrived with their horses. Unfortunately, the numbers of their equines is limited because early missionaries tried to wipe the herds out to control the Indians. These mustangs belong wild and free on the American people’s range LAND wild and free protected by the 1971 WILD and Free Roaming ACTED signed by NIXON. The government and its filthy hench men should be prosecute for slaughtering ,intentional curilty to animals to highest degree of the law . WE THE AMERICAN PEOPLE WILL NOT ALLOW THE BLM TO SEND OUR SACARED MUSTANGS TO EXTENSION. SINCERELY THE AMERICAN PEOPLE .